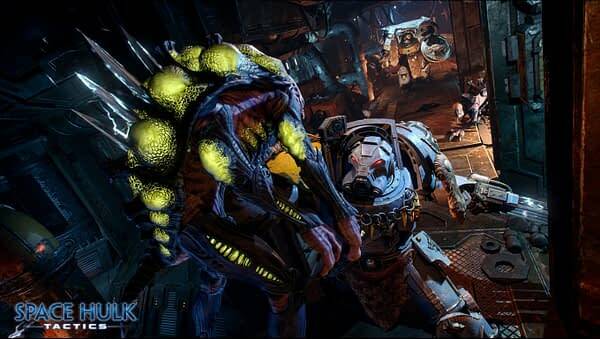 Focus Home Entertainment and Cyanide Studio have officially released Space Hulk: Tactics today, and have capped off the occasion with a launch trailer. The game takes the series into a more grid tactical-RPG setting and forces you to rethink combat with a five-man team. Enjoy the official trailer and description below! On the side of humanity stand the Space Marine Terminators, genetically modified super soldiers clad in heavy armour and equipped with extraordinary firepower that turns them into deadly, walking tanks. Opposing them are the Genestealers, insidious inhabitants of the floating amalgamations of smashed-together starships called space hulks, hiding inside every pipe and duct, prepared to rend anything that comes close to pieces with glistening claws. An innovative new card system gives players greater control over their forces, while two non-linear, narrative-driven campaigns tell a new, terrifying story in the Warhammer 40,000 universe. A full customization system is available across four Space Marine chapters and four Genestealer Hive Fleets, letting you design your force down to the last shoulder plate or weapon hilt. A robust mission editor, inspired by the clip-together nature of building scenarios in the board game, means you can design, share, and play your own maps quickly and easily.